The two-day “It Takes a Village — Feed My Starving Children” event resulted in enough meals packed to feed 894 starving children for a year. Volunteers fill the Haddonfield Middle School Gym for the Feed My Starving Children packing event. 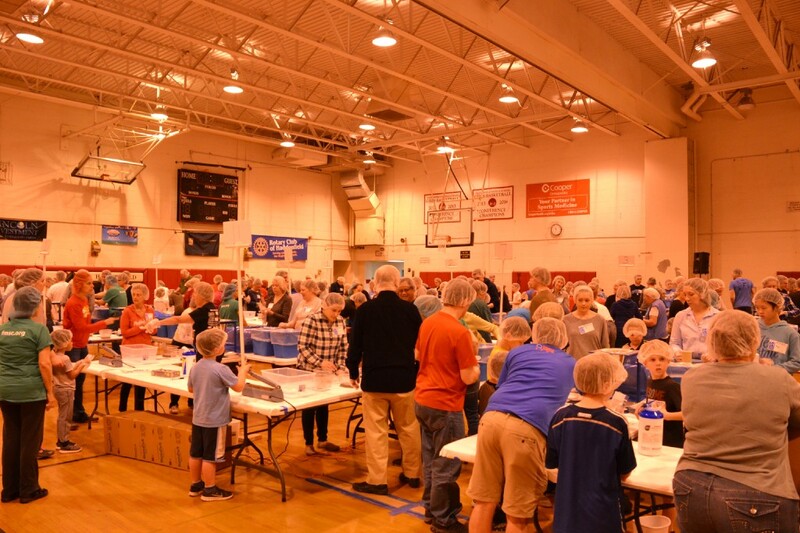 On Saturday, March 24 and Sunday, March 25 the Haddonfield Middle School gymnasium was a hub of commotion with 1,579 volunteers working in seven, two-hour shifts to pack meals for children in schools, orphanages and remote villages. The sea of volunteers gathered at the “It Takes a Village — Feed My Starving Children” food-packing event paused Sunday afternoon to celebrate a milestone when the 1 millionth meal was packed since Feed My Starving Children first came to Haddonfield in 2013. Borough commissioners declared March 25 and March 26 “It Takes a Village — Feed My Starving Children Weekend,” and the two-day event resulted in 326,592 meals packed, which will feed 894 children for a year. Volunteers of all ages packed a combination of soy, rice, dehydrated vegetables and minerals for Feed My Starving Children, a national, faith-based nonprofit feeding people in more than 70 countries. Feed My Starving Children’s mobile packing trucks pulled into town Friday night where they set up tables, small scales and other packing supplies for the weekend’s events. On Saturday and Sunday, music blasted throughout the gym. The atmosphere was like a party, and volunteers came from all over to participate, with some driving two and a half hours to attend. Roy “Chip” Chapman, a volunteer and organizer from Haddonfield First Baptist, said he was especially thrilled when Mayor Jeff Kasko and his family packed meals Saturday. Rice said first responders from Haddonfield’s police and fire departments volunteered. Gerry Rice, the event organizer, said this year volunteers raised enough funds to pack 300,000 meals. Early into Sunday’s packing, staff from Feed My Starving Children informed Rice they had already reached the 300,000 mark. The staff explained to Rice they had brought extra supplies equating to about 26,500 meals, and they offered Rice the choice to stop at 300,000 or to use the rest of the supplies. With the time and manpower already budgeted, Rice agreed to pack the additional meals. However, since the 26,500 meals were not in the initial budget, Rice said the Council of Churches still needs to raise additional funds to cover the expense. In years past, meals packed at Haddonfield have gone to Swaziland, Haiti and South Africa. Rice said she will find out in the coming weeks where this year’s meals will go and how much the Council of Churches raised. Approximately 92 percent of every dollar donated to Feed My Starving Children goes to the food program. The event has grown exponentially in scope since coming to Haddonfield five years ago. The First Presbyterian Church of Haddonfield’s Justice and Advocacy Committee was looking for a church project that could include all age groups. Rice said her sister’s church hosted an annual Feed My Hungry Children MobilePack event, and so she suggested they host their own. 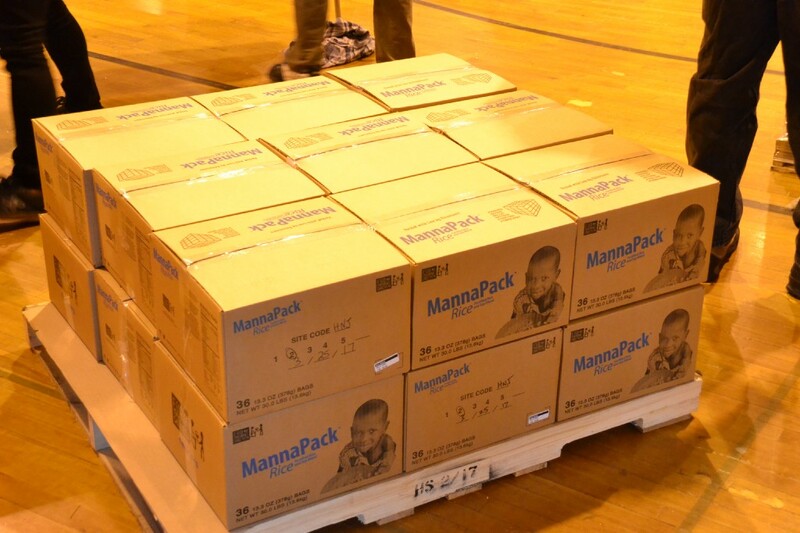 That first year, 500 volunteers packed 109,000 meals, which fed 296 children for a year. Rice said the community’s enthusiasm for the event had the church calling for some extra help organizing last year’s event, and so in 2016, First Presbyterian turned the event over to Haddonfield’s Council of Churches. Since then, the packing has evolved from a church event to a community event, and this year they had to turn volunteers away as they were at their maximum capacity, Rice said. Linda Fiore, a friend of Rice and music teacher at DaCore Talent Education in Glenmoore, Pa., said 55 students from her academy volunteered their time Saturday. She said they also raised money for the event while performing their concerts. “We believe so strongly in this event,” Fiore said. 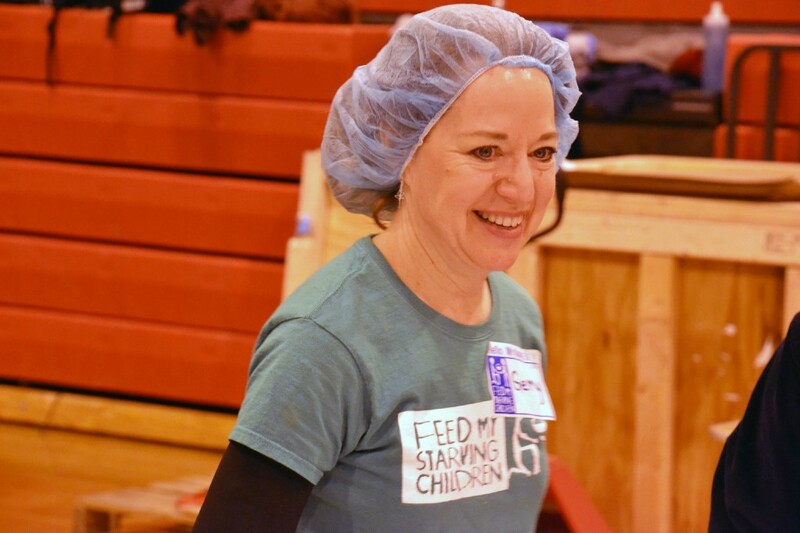 Kirstie Sherman, development advisor-mobile pack at Feed My Starving Children, said every packing event is exciting for her, but Haddonfield’s team stands out. Rice said the experience was a profound one for many volunteers who came expecting to feed others and found it was themselves who were ultimately fed. For more information on the Feed My Starving Children organization or to donate, visit http://www.ittakesavillage-fmsc.com. Boxes of food sit on a palate, waiting to be loaded on to a truck. Food from this event has gone to countries such as Haiti, South Africa and Swaziland.